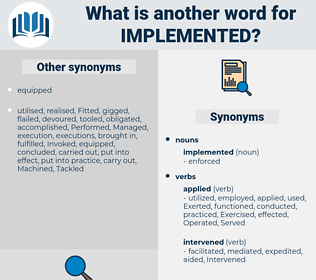 What is another word for implemented? implementation, implementing, Deployed, conducted, executing. imposed, Eliminated, appointed, incorporated, promulgated, organise, organised, Managed, monitored, abide, Mentioned, Upheld, Generated, Promoted, demonstrated, defined, determined, outlined, imported, published, Submitted, en, finalized, transposed, practised, prohibition, effectiveness, invested, pursuant, recognized, removed, preparation, involved, handled, Into, constituted, Achieving, Rendered, encouraged, Instituted, Inserted, Contributed, mounted, accepted, in, Responded, granted, unveiled, Commenced, realise, realised, triggered, prohibited, Prohibiting, assumed, Carried, Prevailed, Prosecuted, commissioned, Embarked, settled, extended, arrangements, issue, Issued, endorsed, understood, Filed, fill, continued, observed, calculated, Envisaged, Began, arranged, honour, Exercised, filled, seized, efficiency, finished, stuck, Entered, Incurred, included, supported, institution, Helped, derived, follow-up, lent, Brought, opened, Benefited, found, donated, acquired, Embraced, Convened, approved, reflected, elaborated, announced, outcome, Assessed, conferred, designed, Captured, Were, Lived, used, intended, Relied, Erected, Fought, Drafted, Levied, Resulted, effect, effected, tabled, Pushed, received, spearheaded, earned, held, struck, expressed, honoured, sent, Gained, Gave, decided, Came, FORMATS, Emplaced, Aimed, Occurred, Picked, cost, Fitted, Waged, Succeeded, paid, plotted, Towards, agreed, Became, Reached, released, Worked, staged, Heeded, acquitted, signed, Happened, forfeited, added, thought, covered, fired, faced, Offered, hosted, charged, tracked, played, Lasted, on-going, needed, founded, Dealt, Voted, formed, kept, stated, Had, Passed, said, Went, Acted, Got, Did, Introduced, put. operationalized, imposed, institutionalized, implanted, communications, appointed, imprinted, compliant, interpreted, consolidated, incorporated, materialised, environment, Compiled, complemented, Translated, terminated, accomplished, presented, integrated, guaranteed, formulated, promulgated, improved, attained, instrumented, printed, reintroduced, represented, pointed, organised, Imparted, Explained, coordinated, Managed, Replicated, abided, Investigated, monitored, Guidelines, adjustment, articulated, abide, written, Mentioned, Upheld, anticipated, Generated, generalized, Promoted, demonstrated, allocated, defined, determined, internalized, utilised, outlined, imported, published, Submitted, regulated, sustained, Supplemented, finalized, transposed, transformed, practised, Intervened, governed, generalised, become, assigned, mandates, mandated, exploited, confirmed, proposed, Examined, conceived, extrapolated, invested, pursuant, cooperation, Disseminated, Indicated, Invoked, permitted, recognized, ratified, constitution, mainstreamed, retained, Adhered, distributed, involved, Attributed, handled, revised, dedicated, Enabled, domesticated, adapted, circulated, Computed, assistance, Caught, Conformed, violated, Rendered, described, prescribed, recognised, located, composed, Instituted, Inserted, Manifested, Contributed, Exempted, engaged, ensured, mobilised, mounted, Installed, accepted, Obtained, suspended, Perpetrated, Responded, granted, Activities, unveiled, Retrieved, Commenced, Inflicted, realised, Penetrated, triggered, assumed, solved, Detained, altered, Carried, Prevailed, punished, Prosecuted, finalised, commissioned, Embarked, settled, authorized, manufactured, Yielded, reinforced, verified, extended, appropriated, specified, Devised, Inaugurated, Issued, amended, expanded, perspective, endorsed, planted, understood, entrenched, items, Filed, financed, embodied, calibrated, limited, contained, Begun, declared, reported, converted, continued, observed, calculated, observance, Comprised, entrusted, arranged, collected, Exercised, Obeyed, devoted, filled, measured, Transferred, seized, assembled, related, Hanged, noted, Enshrined, Channelled, finished, resolved, stuck, elapsed, modified, subsidized, Entered, insured, Piloted, repeated, selected, Incurred, withheld, included, Enjoyed, supported, Helped, derived, adherence, gathered, follow-up, Constructed, lent, Brought, opened, recovered, policy, found, inuit, donated, acquired, satisfied, Embraced, obligated, adjusted, Convened, Emerged, noticed, fostered, registered, promised, ended, hired, approved, situated, actioned, destined, inscribed, expired, reflected, elaborated, taught, Intruded, subsidised, Annexed, fixed, safeguarded, accompanied, joined, obliged, announced, advanced, Meted, diverted, authorised, framework, structured, Been, Prompted, Policed, learned, embedded, moved, Assessed, furnished, designed, tailored, destroyed, bestowed, Captured, bound, guided, attended, Lived, used, trapped, intended, divided, Relied, Delegated, Fought, Drafted, Borne, Misled, associated, attached, treated, proceed, Evolved, Resulted, Fielded, Mapped, effected, actuated, tabled, assured, co-hosted, Pushed, expended, Earmarked, secured, received, pressed, reviewed, Transported, HIT, Discussed, planned, sung, spearheaded, valid, earned, Exported, listed, held, struck, expressed, linked, Resumed, protected, given, honoured, spent, experienced, Taxed, projected, drilled, sent, come, Suffered, Disbursed, Gained, forged, Died, elders, decided, Displayed, phased, affected, Acceded, Emplaced, Aimed, fit, recorded, Remained, known, failed, Occurred, vested, Referred, scaled, Resorted, Picked, Fitted, Harvested, required, driven, Waged, honored, saved, Succeeded, handed, paid, capacity, Lodged, Undergone, preserved, absorbed, deducted, Flown, arrested, posed, reduced, raised, Killed, affixed, expected, won, agreed, spread, mixed, functioning, shared, suited, Reached, concerned, welcomed, foreseen, left, released, woven, Sentenced, Levelled, Worked, scheduled, changed, matched, Programs, rolled, acquitted, sweetened, signed, Happened, processed, Children, forced, chosen, Anchored, staffed, added, Targeted, pleased, covered, Claimed, studied, fired, Afforded, faced, Offered, murdered, attempted, sought, drawn, fed, grown, tested, charged, rooted, uploaded, Awarded, Shown, Housed, shot, artwork, tracked, Answered, posted, fallen, Accorded, played, Grounded, decreed, Allowed, funded, reserved, closed, Caused, Subjected, needed, founded, Approached, geared, seen, Dealt, cast, formed, sprayed, headed, kept, Reared, powered, dead, focused, have, stated, Had, 2004, Passed, crossed, crowned, called, said, heard, Asked, Cared, gone, Meant, Acted, aged, Got, tried, D, 2.4, cut, dated, Introduced, executed, conducted, put. implanted, fulfil, Enacted, Adopting, achievement, executes, utilized, fulfilled, Complied, organized, identified, pursued, following, Adhered, practiced, Caught, engaged, Installed, dispensed, Devised, planted, satisfied, moved, Proceeded, Exported, led, Took, Served, shot, Threw, called, Establishing, implementation, deliver, executed, develop, built, Deployed, conducted, administer. 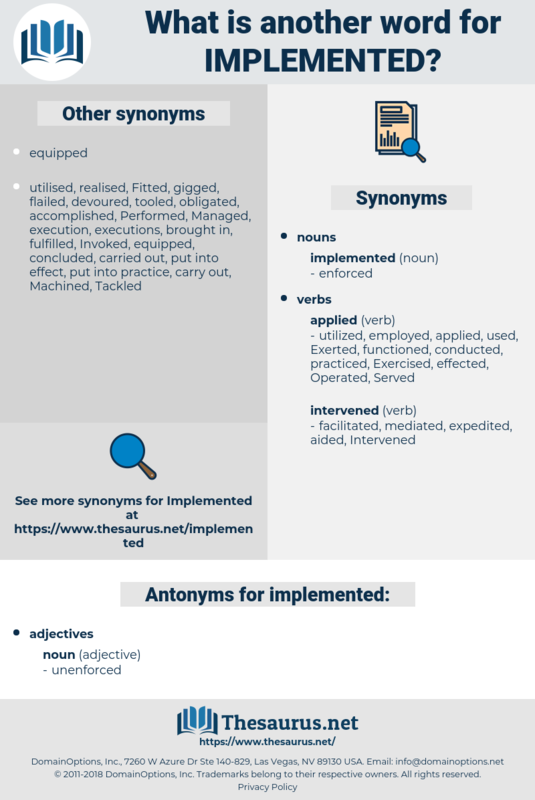 unimplemented, Materialized, Enacted, utilized, fulfilled, Complied, organized, identified, employed, pursued, ascertained, practices, activated, practiced, Tackled, Exerted, asserted, harnessed, Supplied, led, Served, thrown, implementation, built, Deployed.